"A penitent should take time properly to examine his conscience and to determine what he has to say to his confessor before entering the confessional. This is for his own soul's good, as it enables him to make a worthy confession. It is also good manners, as it prevents him from staying too long in the confessional, taking up the priest's time and that of waiting penitents. 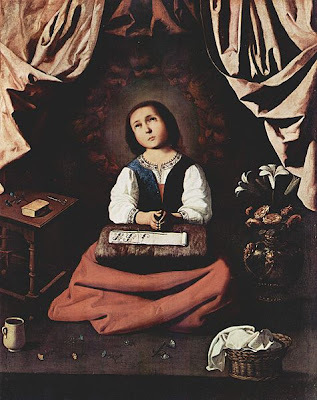 "A penitent should, while awaiting his turn to go to confession, stand far enough from the confessional so as to be unable to hear anything that may be said in it. "A penitent should never push his way ahead of others waiting to be heard. This is not only inexcusably bad manners, it is also, considering the place and the purpose, uncharitable and unchristian. But if someone should push his way into the waiting line ahead of you, do not glare and show your displeasure. 'Offer up' this little trial to our Lord as a sacrifice, and be both a good Catholic and a gentleman. "A penitent should always behave quietly and reverently, remembering Who is present on the altar. School-children going to confession sometimes forget this and giggle and whisper among themselves or tramp about noisily. Parents should caution their children about this. "In the confessional, the penitent should speak in the lowest audible tone. Should one inadvertently overhear any part of what is said to or by another in Confession, one must never repeat it, and should endeavor to forget it immediately. 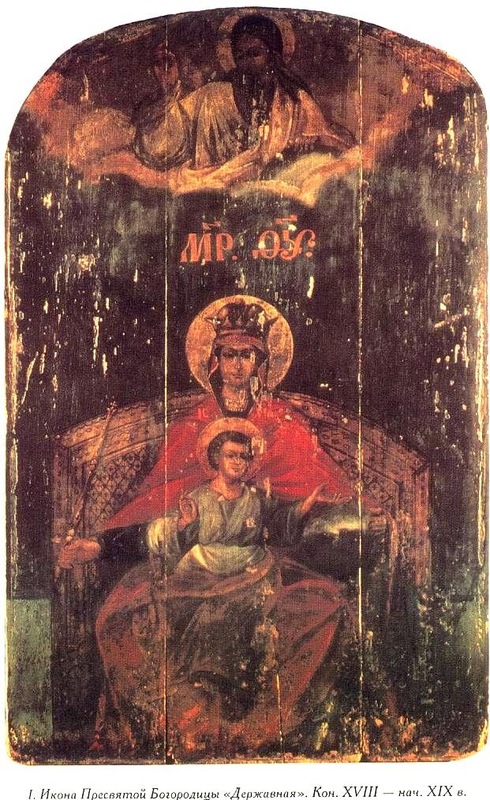 "Out of consideration for others, one should avoid choosing the time of one of the great feasts, such as Easter or Christmas, for making a general confession. Since a general confession takes so much longer than an ordinary confession, it imposes a hardship on the busy priest and the many other waiting penitents. This does not mean that a general confession is forbidden at this time, and one may certainly be made on such an occasion if one feels that one's spiritual health requires it. It merely means that it is a courteous act to defer it to a less crowded occasion if one may safely do so." As for proper dress, Fenner adds, "The proper costume for going to confession is the same as on all other occasions when one is entering the church. When possible, one should be dressed both neatly and formally. . . . Women should buy and keep in their purse the small prayer veils now available, for unplanned visits to the church." As for the spiritual approach to confession, the thoughts of St. Francis de Sales can be found in the post The Lioness and Her Lord. Fenner, Kay Toy; American Catholic Etiquette (Newman Press, Maryland, 1965), pp. 18-19. 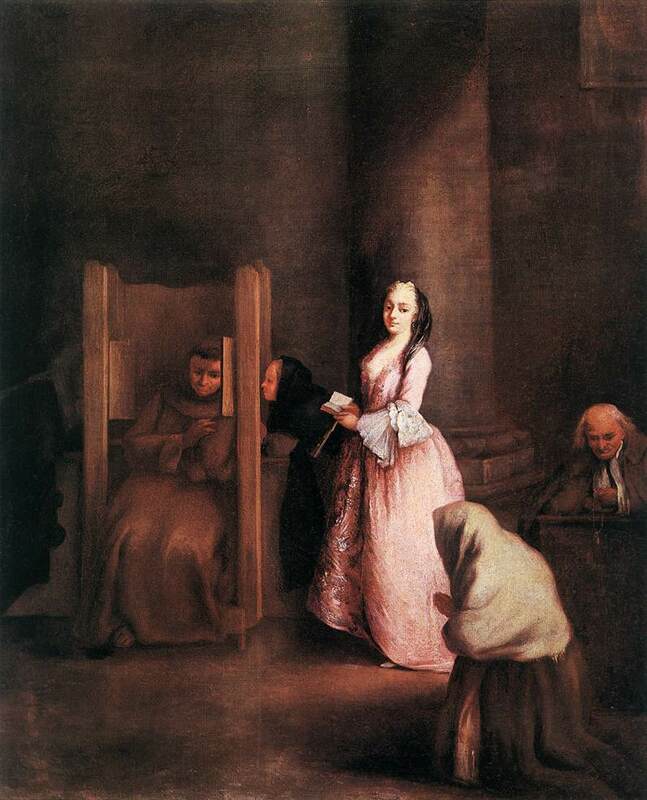 Longhi's "The Confession" (ca. 1750). Oil on canvas. From Web Gallery of Art via Wikimedia Commons. In the public domain.